There are many reasons why PedCath 7 is the standard Pediatric Cath Reporting System in the world. PedCath 7 not only provides a visual database of all patients having undergone cardiac catheterization, but it also has an intuitive user friendly interface, it is universally compatible with all hardware systems, and comes preloaded with lots of features. Listed below are short descriptions of the features that make PedCath 7 the international standard for pediatric cath reporting systems. PedCath 7 proves useful in the hectic day to day schedules all medical professionals face because physicians and nurses can use PedCath 7 quickly and efficiently to create the information they need without having to worry about a steep learning curve. PedCath 7 is easy to use partially because the user only uses two different screens to navigate the entire application: the Browser screen and the Edit Cath screen. Click on the image to the right to learn more about the Browse screen and the Edit Cath screen. PedCath 7 fully meets the applicable state and federal privacy regulations prescribed by the Health Insurance Portability and Accountability Act of 1996 (HIPAA). These privacy regulations, adopted to protect personal health information, became mandatory for most institutions on April 14, 2003. PedCath7 tracks cath views and edits in compliance with HIPAA. 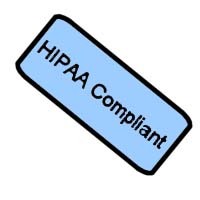 Read more about HIPAA and PedCath7 by clicking on the link to the right. Hemodynamic calculations are provided where appropriate. As you enter the results of a catheterization procedure, the program automatically makes standard calculations and displays the results on the screen. A sophisticated calculation override module allows the physician to replace default parameters with those appropriate for aberrant anatomy. Calculations are updated during data entry to provide the practitioner with immediate feedback. Click on the image to the right to view screenshots of PedCath 7 displaying some of these features. We are proud to be the only company licensed to distribute The Mullins & Mayer Congenital Heart Disease, A Diagrammatic Atlas Published by John Wiley & Sons, Inc.
PedCath 7 can generate, store, retrieve and print high-quality anatomical diagrams from this industry standard Atlas of congenital heart disease. There are over 160 high quality images in this Atlas that may be easily modified to illustrate surgical repair, unusual anatomy, catheter course, devices, and more. PedCath 7 includes a statistical reporting tool that can be used to create reports based on various criteria specified by you for your cath database. For example, a report could display all the caths where the patient was less than seven days old, or list all the patients with Tetralogy of Fallot where Dr. Everett was the attending physician. Once the report query is run, the report will be exported as a PDF document that can be printed, saved, or emailed. Click on the screenshot on the right to view more information of PedCath 7's statistical reporting capabilities. 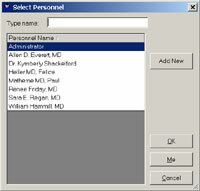 Customizable cath reports with your images and commentary. The printed cath report contains all hemodynamic data, as well as hospital and patient information, the patient's anatomical diagram, and standard calculations. The diagram and other data can be exported to disk in several standard formats, to be used by your institution's internal information systems or directly emailed to other doctors. We can customize your PedCath 7 reports so that your Hospital's logo and signature line appear at the top of every report. Click on the screenshots to the right to learn more about our custom cath reporting feature of PedCath 7. You may select diagnosis and intervention codes to be stored as part of each PedCath 7 cath record. Whether you are using the standard diagnostic code set or an optional one, you can easily select codes and then rank them in order of importance. PedCath 7 offers the choice between many widely used code sets. Current choices include the code sets from Boston Children's Hospital, Toronto Hospital for Sick Children, Texas Children's Hospital, and the European code set. Billing code sets are available and are constantly kept up to date as codes are added and/or modified. Click on the screenshots to the right to learn more about diagnostic and billing code sets that come with PedCath 7. You may modify any diagram to match the patient's unique anatomy by using PedCath 7's built-in image editing software. The drawing tools allow you to add text to the diagram or to insert arrows indicating the course of the catheter. 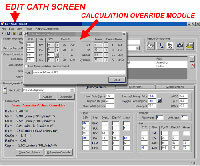 In addition, you may save the modified diagram as a template, to be used as a starting place when recording future cath data for the same patient. Click on the screenshots to the right to learn more about PedCath 7's advanced image editing capabilities. 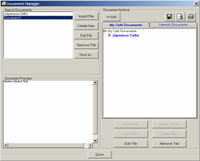 The image manager allows you to add images and captions to the cath record. When multiple images are associated with a cath, previews of the images are displayed along the left and right margins of the image manager window. Click on the thumbnails to the right to view high-resolution screenshots of PedCath 7's Image Manager. The document manager allows you to generate, store, import, open, modify, delete, and/or print documents with each cath report. PedCath 7 runs on any operating system and can synch up with GE (Maclab), Witt (Calysto), and Siemens (Sensis) catheterization lab hardware. PedCath 7 is available in many different languages, but not all. Contact us if you are a medical professional and wish to learn more about translating PedCath into your own native language. PedCath 7 also provides improved and expanded searches, measurement options, and staff tracking. Now that you have read about all of PedCath 7's great features, try the demo out today by clicking on one of the icons to the right.